Comparison of Visual Outcome and Regression Pattern of Myopic Choroidal Neovascularization After Intravitreal Bevacizumab or After Photodynamic Therapy. Hayashi K, Ohno-Matsui K, Teramukai S, Shimada N, Moriyama M, Hayashi W, Yoshida T, Tokoro T, Mochizuki M.
Am J Ophthalmol. 148：396-408, 2009. Intravitreal bevacizumab on myopic choroidal neovascularization that was refractory to or had recurred after photodynamic therapy. 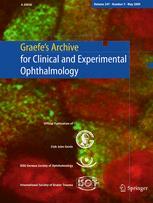 Hayashi K, Ohno-Matsui K, Shimada N, Moriyama M, Hara W, Yoshida T, Tokoro T, Mochizuki M.
Graefes Arch Clin Exp Ophthalmol. 247：609-618, 2009. (C) Copyright Yokohama Sakuragicho Eye Clinic All Rights Reserved.